The 70 is the largest in the Hylas line, an extended version of 66-foot German Frers design. 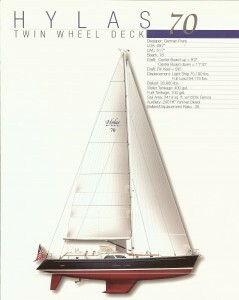 She comes in centerboard and fin keel models. Production is tempid, so please inquire to book an open production slot. Please see our Hylas Models Page for information about other Hylas models. Contact us or Hylas Yachts USA for more information.